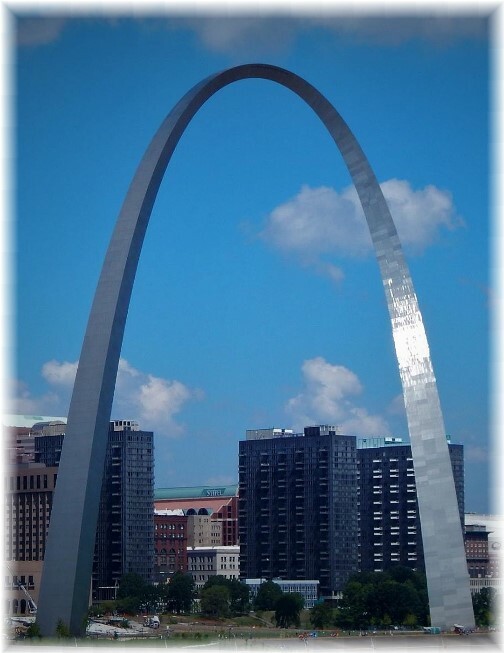 Home » » "Friendship Blessings"
Crossing the Mississippi River into Missouri Ester took this photo of the majestic Gateway Arch in Saint Louis. "Thinking He was in their company, they traveled on for a day. Then they began looking for Him among their relatives and friends" (Luke 2:44). "Friends always show their love. What are brothers for if not to share troubles?" (Proverbs 17:17). We are in Tulsa, Oklahoma for a couple of days. Without realizing it, when looking for a motel in Tulsa, I booked a Comfort Inn right next to Brooksyne's Technical school where she attended her junior and senior years to study cosmetology. This evening she has arranged a gathering with friends from her elementary school, several which were also her neighbors growing up in West Tulsa. Monday evening we had dinner with David and Sandy Simpson. Dave is the friend I've had the longest contact with in life. His large family became our neighbors in Belton Missouri over fifty-five years ago when we both attended first grade. We went through grade school and Junior High before my family moved from the area. But Dave and I have stayed in contact all these years. It was interesting to reminisce together over dinner as the wives and Ester politely listened on. Yesterday, on our way to Tulsa while traveling on the Will Rogers Turnpike, we made our usual stop in Carthage, MO to visit the Precious Moments museum, an incredible viewing of Sam Butcher's gifting with the paintbrush as he painted hundreds of his teardrop characters within mural settings in the Precious Moments Chapel. Brooksyne collected a few Precious Moments figurines in the past but we do very little collecting these days. Brooksyne would say cute collectibles inevitably become dust collectibles. So we've turned our attention more to collecting friends along life's journey and we keep adding to our collection. Of course since our marriage we have mostly mutual friends and for many years now we've been taking photographs of these friends. They are placed in a folder on my computer labeled "friends" and many have been placed up on this site. In fact, since around 2005 when we began archiving and posting photos on our site, we have over 1,200 photos in the "people" folder. One of our more recent friends is Phil, whom we met this spring in our chaplaincy ministry. 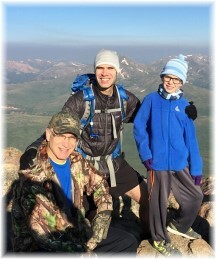 Yesterday he texted us a photo of himself with his son and grandson on Mount Bierstadt, a 14,065 "fourteener" they had just climbed in Colorado. It's great that we can still make new friends even as we stretch toward our senior years! It's quite a collection and periodically I go through it and reminisce. If you join us for a meal in our home we'll ask you to sign our guest registry (if we remember), and we'll likely take your photo. It helps instill memories of past visits from friends and family over the years. We encourage our readers to keep a Guest Book since we regret that we didn't keep one from the beginning of our marriage as some do. We enjoy having friends visit our home, but perhaps you've travelled with a group of friends to events like CREATION, Family Camp or other settings where many out of town people are staying for several days. We look back at a time when Jesus was only a boy and did just that. He was twelve when the events concerning the daily verse occurred, "Thinking He was in their company, they traveled on for a day. Then they began looking for Him among their relatives and friends" after Jesus' parents "lost" him after a trip to Jerusalem. Notice that His parents' sought for Him among their "relatives and friends". Of course we know that Jesus was actually back with the religious leaders, but the wording of the text indicates that it was Christ's practice to spend time with relatives and friends. That's where His parents assumed He would be so that's where their search began. I suppose we don't think much about Jesus having friends as a little boy. But He surely did. It's normal and healthy to have friends and the Scripture declares that Jesus "grew in wisdom and stature, and in favor with God and men" (Luke 2:52). Growing in favor among men would surely include developing lasting friendships. Jesus considered His disciples to be friends. He said to them, "You are my friends if you do what I command" (John 15:14). Obviously, if they chose to walk away from Jesus' teaching about God's commands that would make them uncomfortable in being with Jesus and put distance between them. Later, after Christ's resurrection, in one of His encounters with His disciples He has this exchange, "Friends, haven't you any fish?" (John 21:5). The Apostle Paul was also blessed by many friends. I enjoy this rather obscure passage, "The next day we landed at Sidon; and Julius, in kindness to Paul, allowed him to go to his friends so they might provide for his needs" (Acts 27:3). Paul seemed to have friends wherever he went which means he was regularly making friends along the way. We thank God for our friendship collection. The really neat thing about this collection is that, unlike other earthbound collections, our friendship can continue throughout our eternal dwelling in heaven. All our friends who follow Christ will be among those with whom we spend eternity where we will continue to enjoy meaningful conversations which will surely include some delicious meals here and there! Perhaps you will consider your friendship collection today. Make an effort today to contact an old friend. You might also consider making a new friend. It will bless you and it will also bless your friend! Daily prayer: Father, we want to show our love to friends in regular conversation and in tangible ways as we reach out to them and express personal interest in their lives. Proverbs 17:17 teaches us that "Friends always show their love", not only in the good times but we share together in times of trouble upholding, supporting, and bearing their burdens with them on life's journey. As we mutually bear our burdens we are strengthened and encouraged together. Our lives are greatly enriched by the friendships we establish and grow from day to day. Amen.